Modern, unpretentious French cuisine in a prime waterfront location. Entertainment: DJ Fri.-Sat. after 10:30 p.m.
: Situated approximately half-way along the Bund, the restaurant affords a view that’s probably about as good as it gets, so try to secure one of the tables near the window. 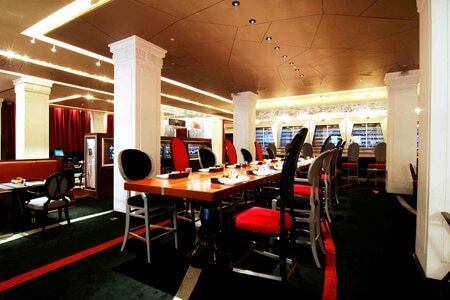 A French chic pervades the décor and a red hue prevails, seen in the seats, curtains and paneling. The first surprise you’ll experience is the length of the menu at more than 200 dishes; the second is that the kitchen seems to be able to prepare them all so well. Meunière truffle bread is a must-try starter and elevates its rustic roots to a new level with the addition of truffles for a rich, earthy flavor. Offerings span from French classics such as beef bourguignon and frogs’ legs to more innovative selections marked on the menu with a “PP.” Chef Paul Pairet has fun playing with Asian influences in the likes of king prawn steamed in a jar with lemon, orange and pomelo, complemented by a soy sauce peppered with dill. There are serving stations attached to each table. Desserts include the familiar-sounding gâteau au chocolate as well as “Pineapple Passion Sashimi” with five spices popping sugar. Thirty-two wines are commendably available by the glass and they stock around 250, mainly French vintages, which guests choose from an iPad menu. Service is professional with staff very attentive and well-informed.